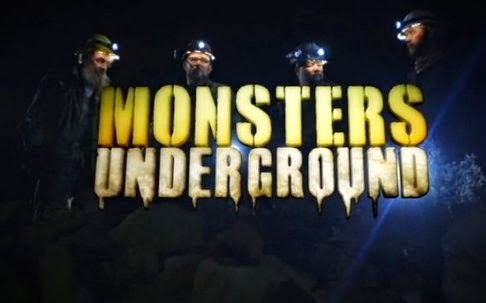 After debuting its first two episodes on Discovery Channel on September 4, the remaining four episodes of MONSTERS UNDERGROUND will premiere on Destination America. In MONSTERS UNDERGROUND, a military survivalist, a trained biologist, a reclusive hunter-tracker, and a hulking pro fighter investigate deadly monsters living in the most inaccessible environments on earth: underground caves, caverns, and mines. There, they seek out legendary creatures that thrive in the cold, damp darkness beneath our feet. For thousands of years, myth and folklore have warned of beasts that prowl the underworld. Now, Bill Brock, Jeremy Bates, Casey Onik, and Richard McGhee dare to trespass on their realm for the sake of discovering the truth, putting their lives on the line to venture deep under the earth’s surface. One wrong move could turn the cave into their tomb. But the most dangerous threat of all is the pitch-black darkness and the risk of coming face to face with a cave creature – such as the shape-shifting Aswang or the bat-like Olitiau – and not seeing it until it’s too late. Bill Brock and the team venture into the abandoned Shadow Mine in Calaveras County, California, to hunt the Subterralien, a possibly armed and hostile creature that might be more sophisticated than any they have hunted. The team travels to Northern California where a river cave called Cross Creek Cavern is believed to house a monster known as the Draco, a vicious lizard/human hybrid that lives beneath the surface of the dark waters. Bill Brock and his team travel to Two Guns, Arizona, to the Apache Death Cave – the site of an infamous Native American massacre – in search of the Aswang, a legendary shape-shifting, vampiric creature that’s part dog and part human. The team travels to Peach Springs, Arizona to a show cave called The Grand Canyon Caverns, to investigate a newly discovered section of the cave, unexplored by man but possibly hiding a murderous creature known as the Rake. In the maze that is Flagstaff, Arizona’s Volcano Caverns, Bill Brock and his team believe that a giant, deadly reptilian bat creature known as the Olitiau, or “cave demon” has made this cave its home. Bill Brock and his team suspect recent black bear deaths are due to the Mapinguari, a descendant of the giant prehistoric sloth. Together they travel to Graveyard Gulch, a treacherous cave in Northern California to hunt this deadly monster.